Complex molecular systems are composed of several atoms, e.g., this includes C60 fullerene, molecules of biological interest such as nucleobases and amino acids, polycyclic aromatic hydrocarbons (PAH), but also weakly bound clusters of these molecules and of smaller molecules such as water. 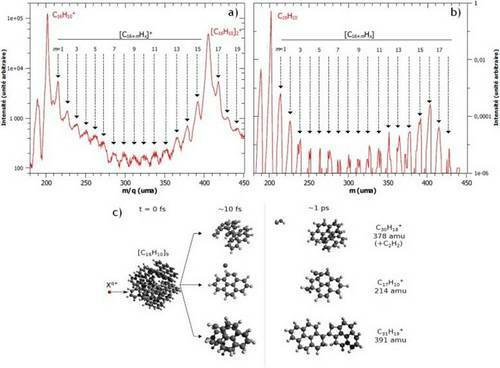 Mass spectrum of the cationic products of the interaction of 24 keV O2+ ions with pyrene clusters [C16H10]k. b) Simulated mass spectrum of the interaction of 24 keV O projectiles with [C16H10]9 clusters. c) Snapshots of molecular dynamics showing some growth products obtained. These complex systems posses a large number of degrees of freedom and therefore, a wealth of de-excitation processes is expected to occur depending on the excitation energy of the system, its charge state and the timescale. In the AMA group, the interaction of low-energy (some keV) multiply charged ions is used to ionise and excite complex molecular systems. Lower inset : Snapshots of molecular dynamics simulations of the glycine dication : a) Coulomb repulsion and b) intramolecular H transfer leading to NH2CH2+ + COOH+ and to the geminal diol [NH2CHC(OH)2]2+, respectively. Upper part : A section of the coincidence map for the fragmentation of the glycine dication into two charged fragments after the interaction of neutral glycine with 387.5 keV Xe25+ ions is also presented. The time-of- flight (in ns) of the heavier fragment (TOF2) is plotted as a function of the time-of-flight of the lighter one (TOF1). 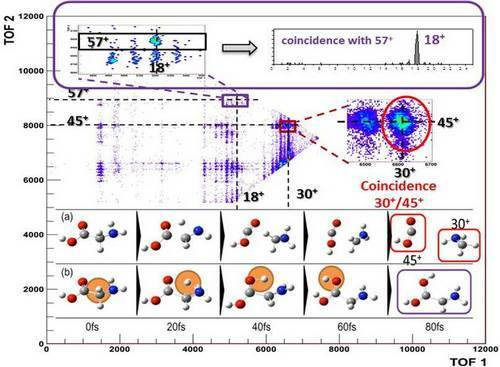 Moreover, we benefit from the expertise in the production of gas phase complex molecular systems, including clusters (pure and hydrated using a gas aggregation source) to study the effect of a chemical environment on the de-excitation processes.